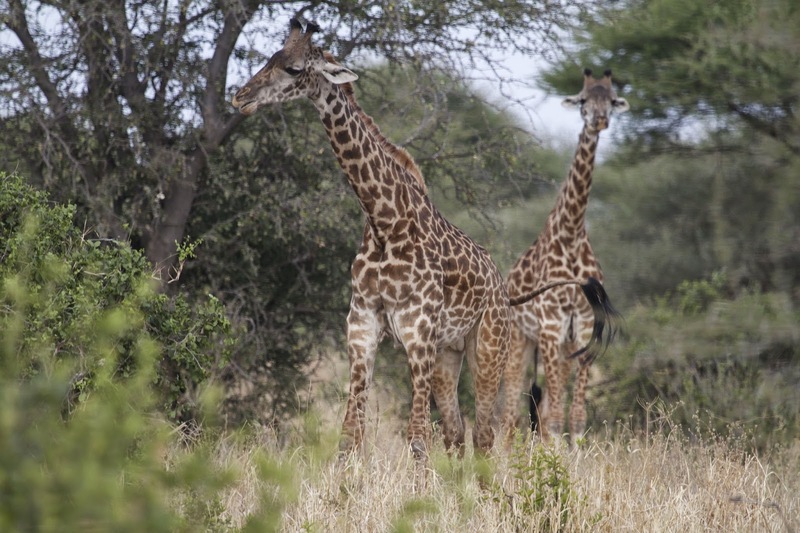 After finding our way through the distracting array of animals in Tarangire National Park we finally pulled into the public campground, our first experience with camping in Africa. After the harrowing ride through Arusha at rush hour and rough, corrugated roads in the park we were a bit frazzled by the time we found it. 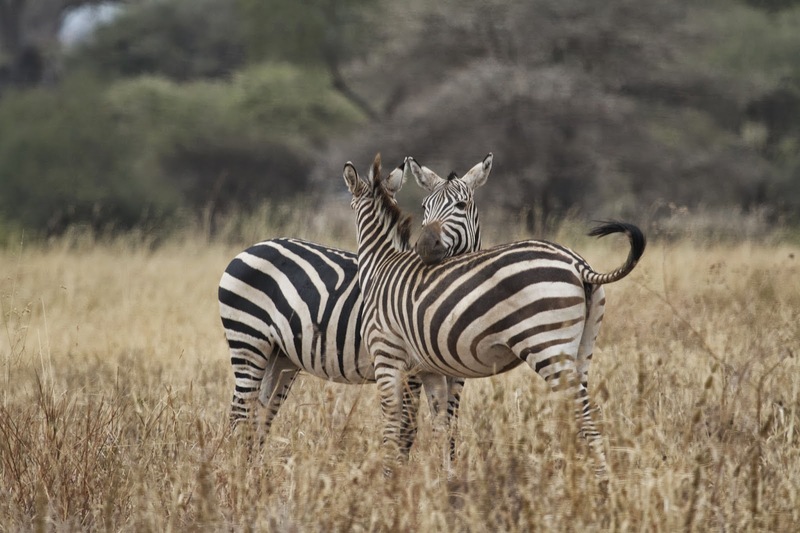 So much so that we forgot the first rule in human relations in Tanzania: say hello before you get down to business. 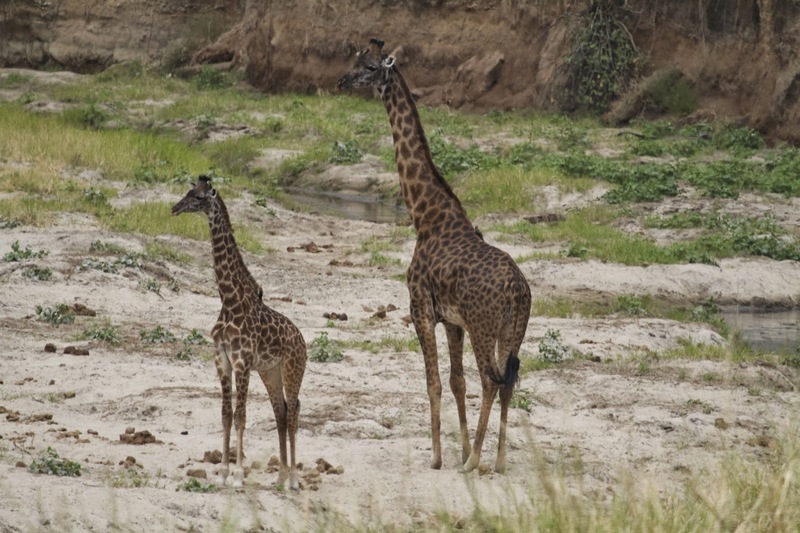 Tanzanians are big on greetings, to the extent that just saying hello can sometimes take five minutes or more. They consider it rude to come barreling in and start asking questions without so much as a "Jambo" (Kiswahili for hello). Of course this is the first thing we did. Oops. Eli (pronounced Ay-lee), the Maasai campground host, was a good sport and forced us to slow down and do the right thing. After exchanging greetings and pleasantries he led us to a nice spot between two trees and told us to find him if we needed anything else. Our closest neighbors brought their two small children, how awesome is that? 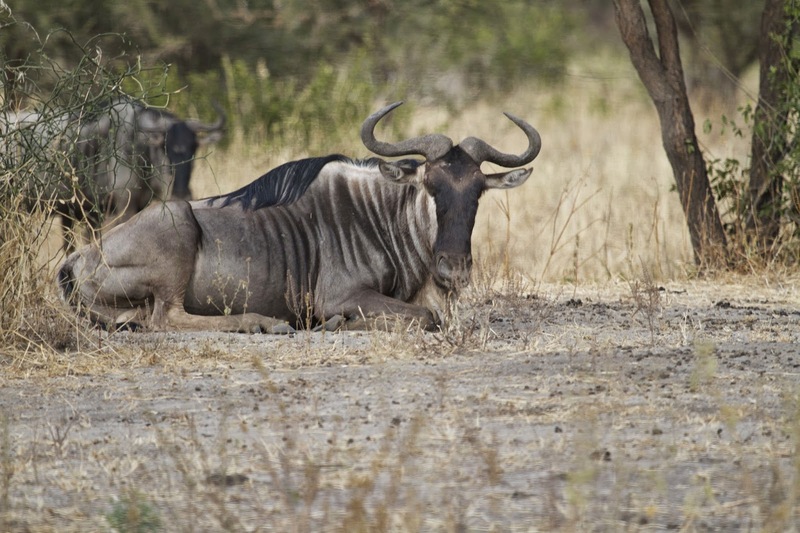 Herds of gnu and zebra can be seen just beyond the camp. 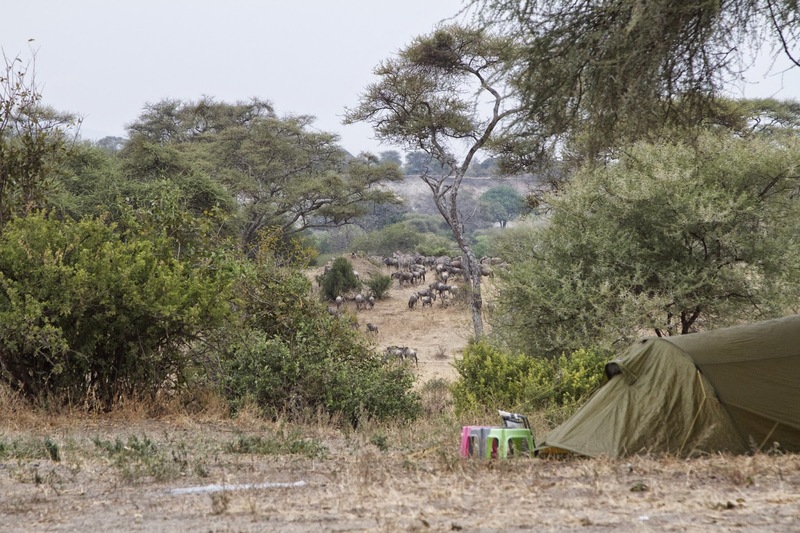 Public campgrounds in Tanzania more closely resemble our group campgrounds here in the U.S. 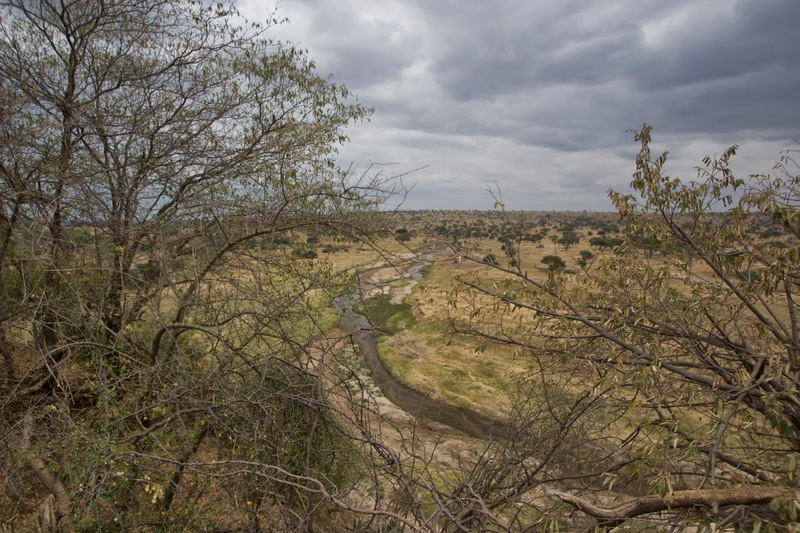 The grounds are sometimes defined by a few rocks around the edges, but more often than not they are a wide dusty spot on the savannah with a bathroom on one edge and a cookhouse on the other. 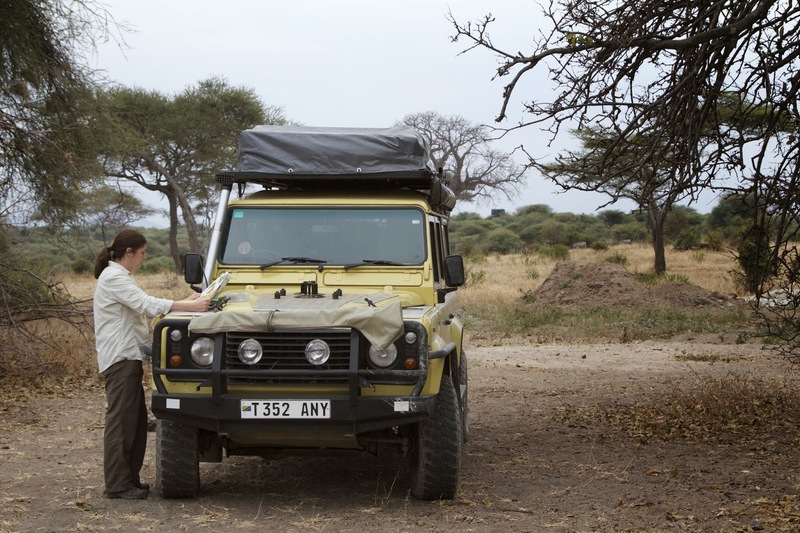 There are no numbered pull-in sites designated for each vehicle, it's more of a willy-nilly approach (something we found to be true of many things in Tanzania.) After we pulled in and found a flat spot to park several more vehicles showed up from an organized tour group and blocked us in, setting up tents all around us. Luckily, we weren't planning to go anywhere until morning anyway. The view just behind our camp. 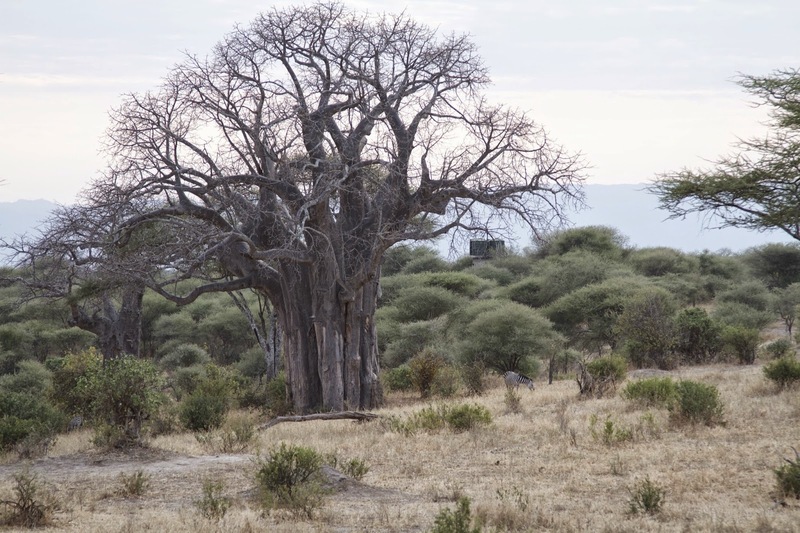 A zebra (grazing, right of tree) is dwarfed by the huge baobab tree. There are several rules you have to abide by in the parks: no driving at night, stay in your vehicle at all times except in designated areas and no walking around after dark even in the designated areas. This makes it imperative you find your campsite, cook dinner and clean up before sundown. Once everything is stowed away, enjoy the sunset, maybe have a little fire, then go to bed and stay there until the sun comes up. 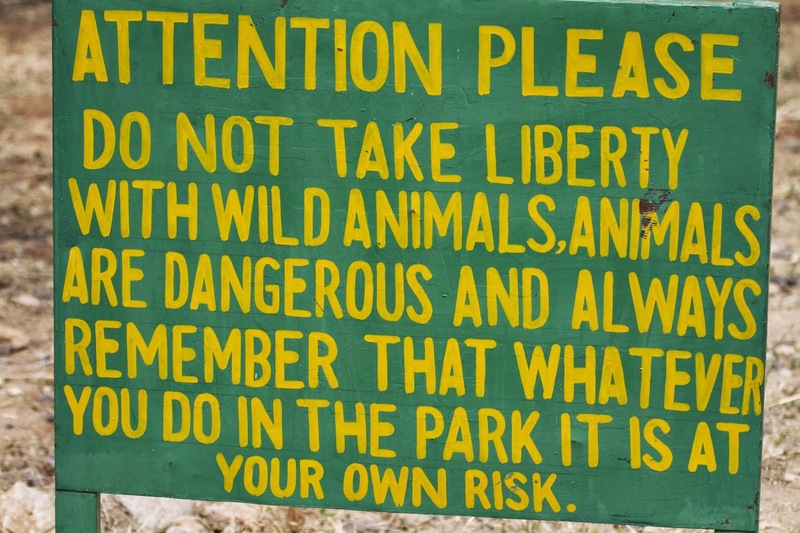 This is all necessary because there are no fences or lights around the grounds; the animals are free to roam at will. 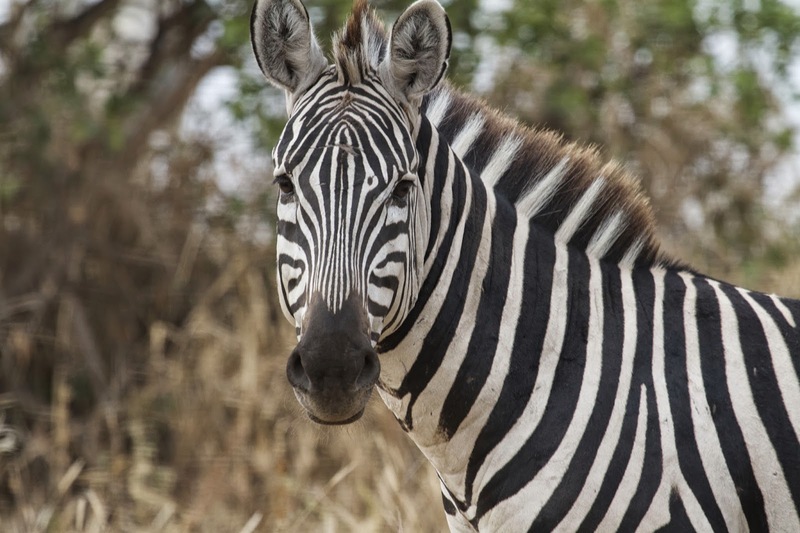 If you get up in the middle of the night and start stumbling towards the restroom you just might trip over a sleeping zebra, or even worse become a snack for one of the nocturnal predators. Either way, not a pleasant experience. So on our first night we were determined to find our spot and hunker down. Shaw had provided boxed lunches for us that morning but we hadn't eaten in our flustered state; we devoured them for dinner. 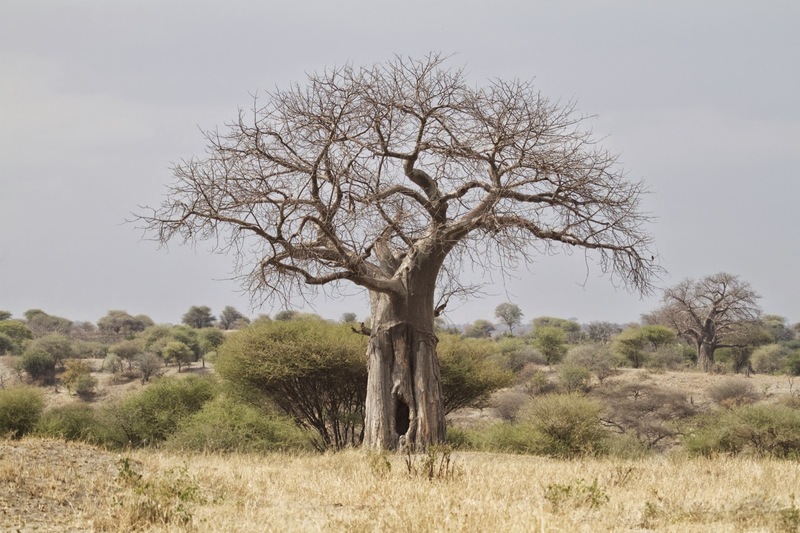 At 6:30pm sharp, the sun went down in a fiery blaze, lighting up the baobab and acacia trees with a bright red glow. We were starting to feel like we were in Africa. The night air filled with what sounded like a cheesy soundtrack entitled "African Sounds." 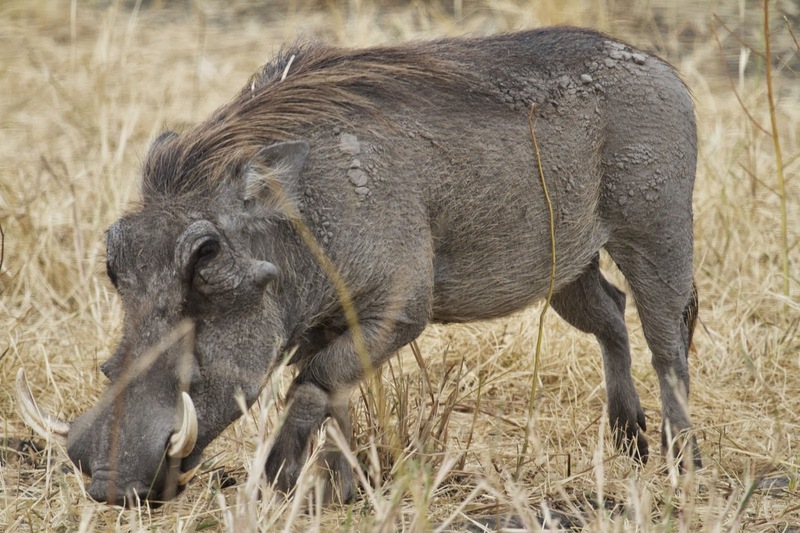 Elephants trumpeted, lions roared in the distance, gazelle made the strangest squeaking noises and zebras spent a lot of time snorting. We were exhausted from the day's events but kept staring at the ceiling of the tent trying to guess what animal was making which noise and how close it was. It wasn't exactly scary—we had met the night ranger armed with the AK-47 earlier in the evening—but it was so exciting to finally be in the middle of it all. 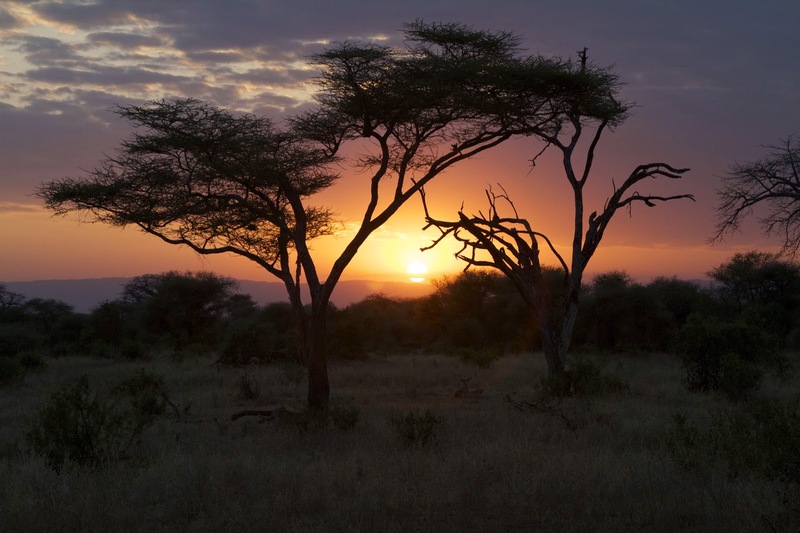 The sun sets beyond the acacia trees. 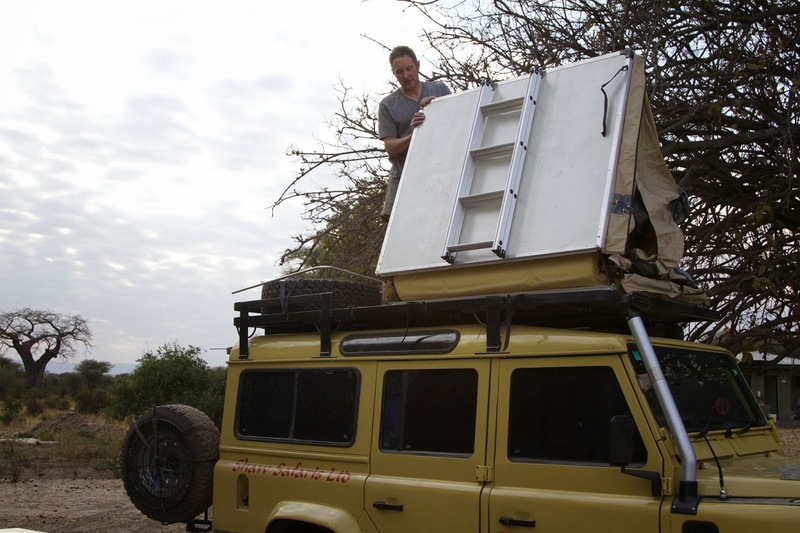 After breakfast we loaded the car, strapped everything down tightly and climbed in, ready to find some more animals. When Mark turned the key we heard "Ahwuh..ahwuh..aaahhwwuuuuh...." The battery was very nearly dead. We checked everything: the headlights (off), the radio (off), the GPS (shouldn't matter, it doesn't go on without the key), the dome light (there wasn't one). We couldn't find anything amiss, but yet it was drained. Luckily, there was a spare battery and a switch box; we flipped it to "accessory" and the car started right up. First problem solved, but a mysterious one revealed. 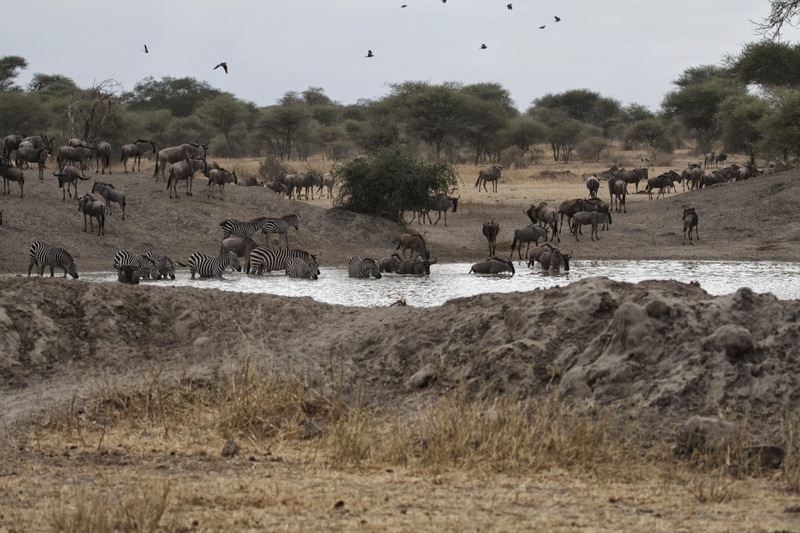 What passes for traffic in Tarangire National Park. We trundled off to explore the river valley, following a rough road leading south. We made a few sandy crossings of dry tributaries and drove up onto a hill overlooking the main riverbed. 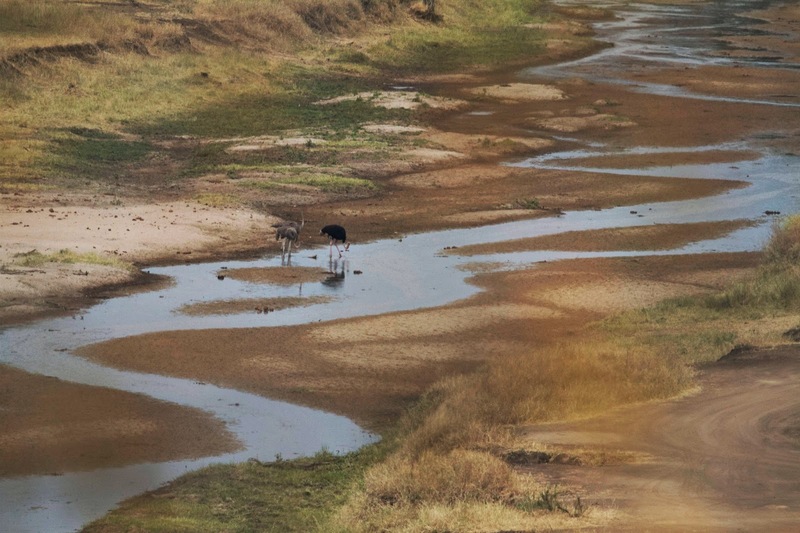 There before us were at least 30 elephants, digging in the sandy soil for the water below. So amazing. 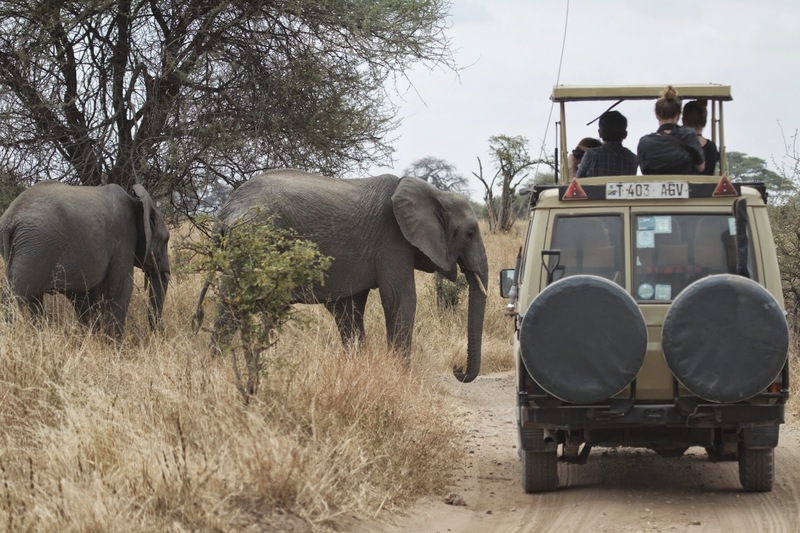 We followed another safari vehicle loaded with tourists, figuring they would lead us to more animals. They disappeared around a corner and when we caught up to them they were turning around and heading back towards us. The driver stopped and advised us to do the same; a bull elephant wasn't too happy about vehicles crowding his herd. We got a quick photo and made the turn too. 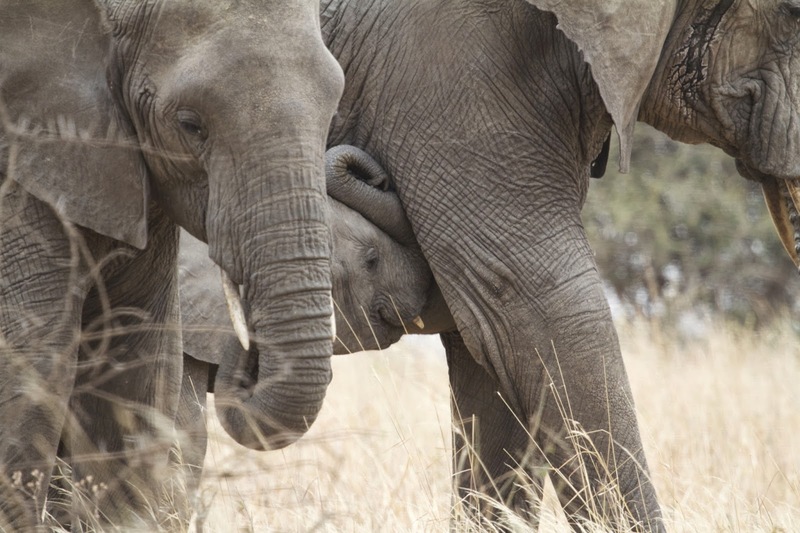 It's best to listen to the bull elephants. We drove for a while, meandering around trying to figure out where we were on the map. 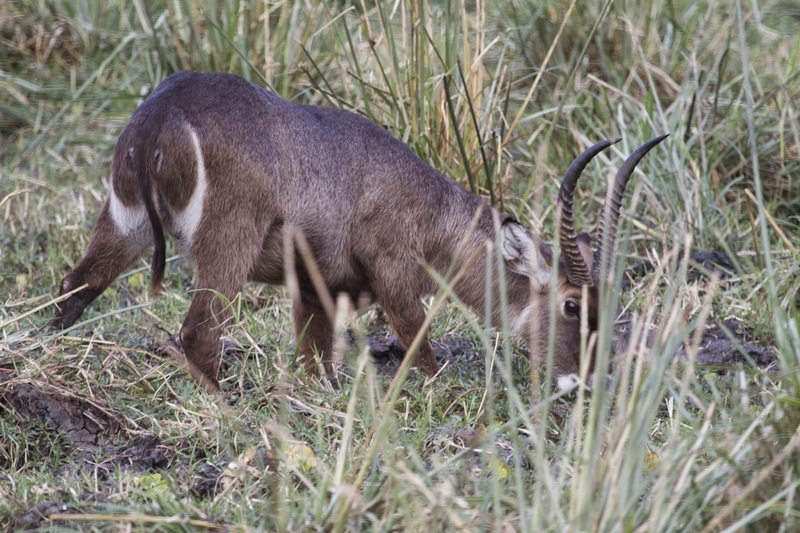 We finally gave up on that plan and started taking whatever road looked promising for game viewing. 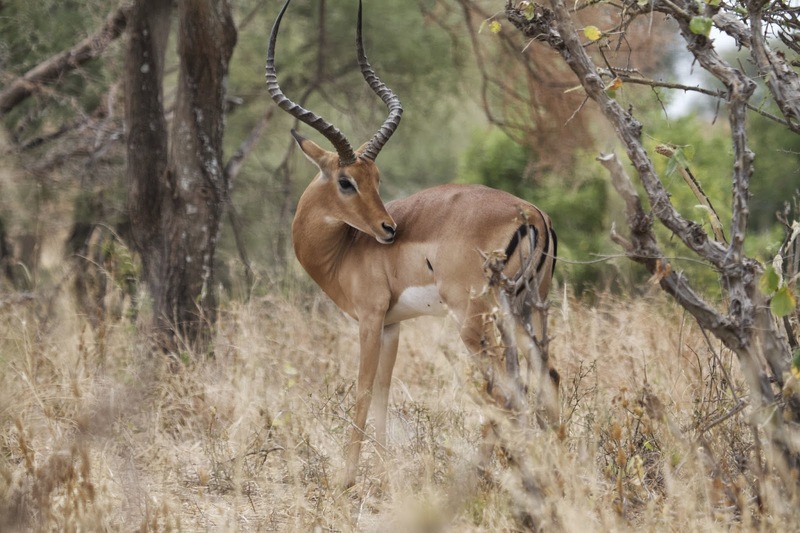 We came across a lot of zebra, gazelle, impala and baboon. 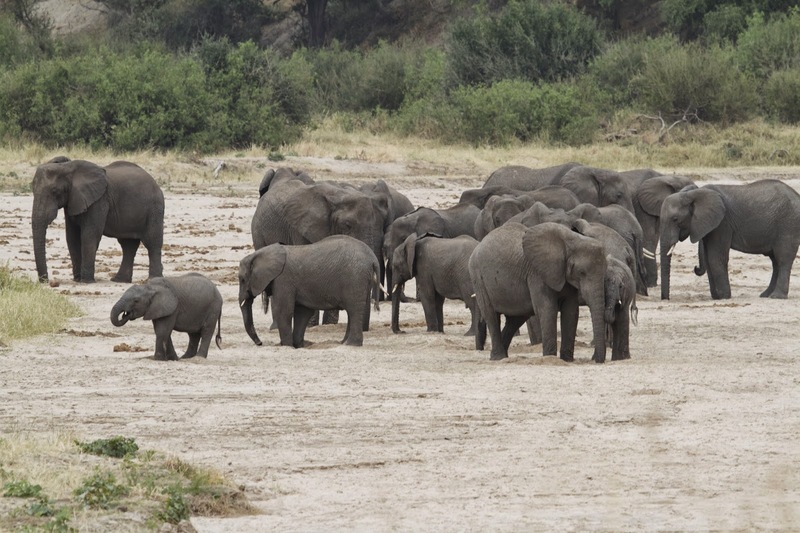 We found a few smaller herds of elephant. But the most curious sight of all was Adam. We were driving up a hill on a loop that overlooked the river. As we circled back we noticed a man up ahead; he was holding a bowl and spoon and talking on a cell phone. 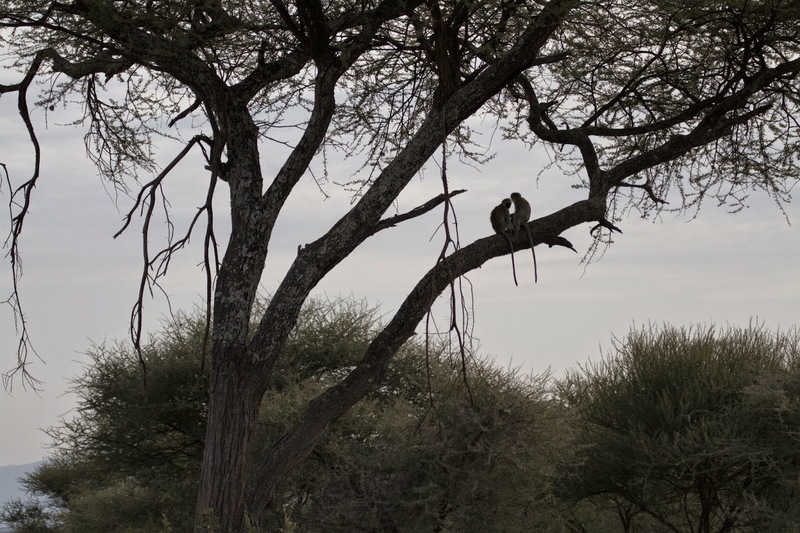 He waved at us and seemed unconcerned that he was standing in the middle of an area where moments ago we had watched an elephant tear down a tree. Where the hell did he come from? We introduced ourselves and asked him how he was doing. He said his name was Adam and he worked as a cook for the lodge down below. He walked up after breakfast to take advantage of the cell reception on the hill and call his family back home. We talked about his job, where he came from, where we came from ('Obamaland?') and where we were going. He thought we were very brave to be driving ourselves around and sleeping on top of our car. "Next time," he told us, "you will hire me to cook for you! You call and ask for Adam and I will come with you!" We told him that sounded like a fine idea. After making sure he was ok, we continued on our way, smiling and shaking our heads. We didn't feel brave at all, not after seeing Adam walking around with roving elephants and God knows what else lurking in the grass. We had actually planned ahead and made some lunch before we left in the morning, but needed to find a picnic area so we could get out and eat. 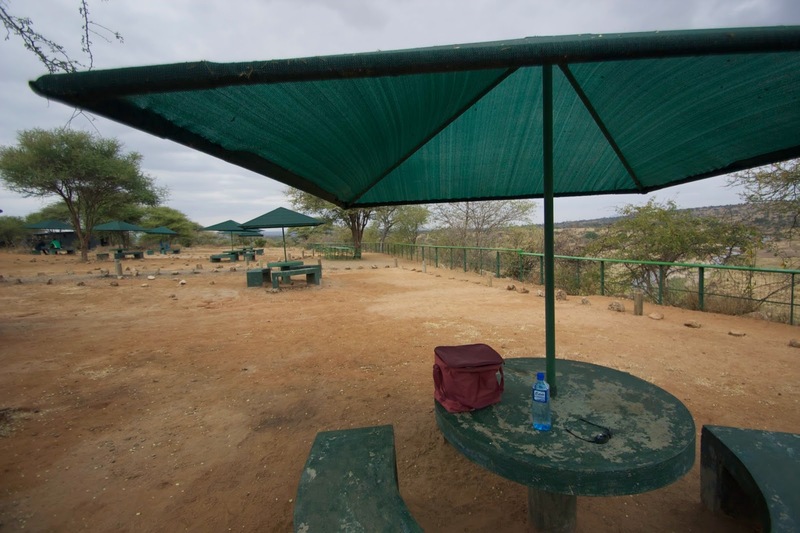 Designated areas are placed around the parks here and there and are equipped with picnic tables and restrooms. It's the only place other than the campgrounds that you are allowed to get out of the vehicle, so it's important to know where they are. The picnic site, with our lunch box of PBJs and water. We stopped at a nice one overlooking the river, joining about 10 other safari vehicles in the lot, ours being the only self-drive of the group. We watched as the tour drivers carried pre-made boxed lunches out to the tables for their guests while we ate our measly peanut butter and jelly sandwiches and drank from our shared water bottle. This would become an increasingly desperate ritual for us, but on this day we thought we were lucky. We drove ourselves! We made our own lunches! We are not lazy! We are capable! 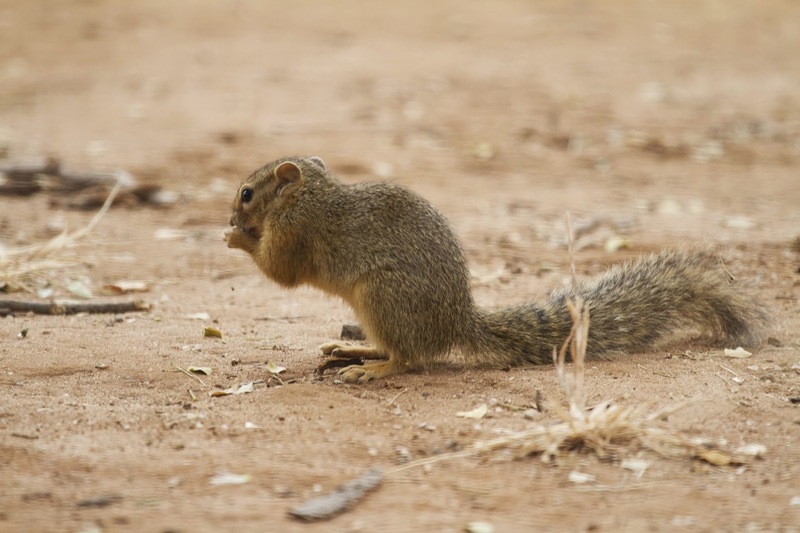 African squirrel. Just as pesky as ours at home. There we discovered the one commonality to every park we've ever visited anywhere: squirrels. As soon as we pulled our sandwiches out they appeared, begging for a handout. It was kind of comforting to see something so familiar in this faraway place. Back at the car, we were able to coax out a "ahwu..ahwuu..." Really dead this time. Dammit. We switched over to accessory again to get it going and started to fret. What if the battery completely dies in the middle of nowhere? Is the accessory battery charging, or are we draining that one too? We couldn't really enjoy the drive now with that worry in the back of our minds, so we stuck with the more heavily traveled roads (just in case) and found a good spot with cell coverage to call Shaw. Paul (of Shaw Safaris) guessed it had something to do with a new part they had installed just before we took the car. He and Mark worked out that yes, the accessory battery was charging, so we could use that one for the ignition for the rest of the trip, and if we were really worried about it we could buy a new battery to keep as a spare and he would reimburse us when we returned. We felt marginally better about things after that and enjoyed the rest of the afternoon's game drive snapping hundreds of photos. Mapping out the drive ahead. Back at camp a little early, we set up our table and chairs and studied our maps; the next day we would be moving on to a new park and we wanted to be sure of the route. As we sat, enjoying our cold beer and soda, we heard a distant buzzing sound. A plane do you think? Nah, we haven't seen any airplanes since we left the airport. The buzzing got louder and louder as we looked around for the source. Suddenly what can only be described as a carpet of bees flew overhead, about 10 feet wide and 30 feet long. A squadron of bees! It was the most incredible thing I've ever seen. 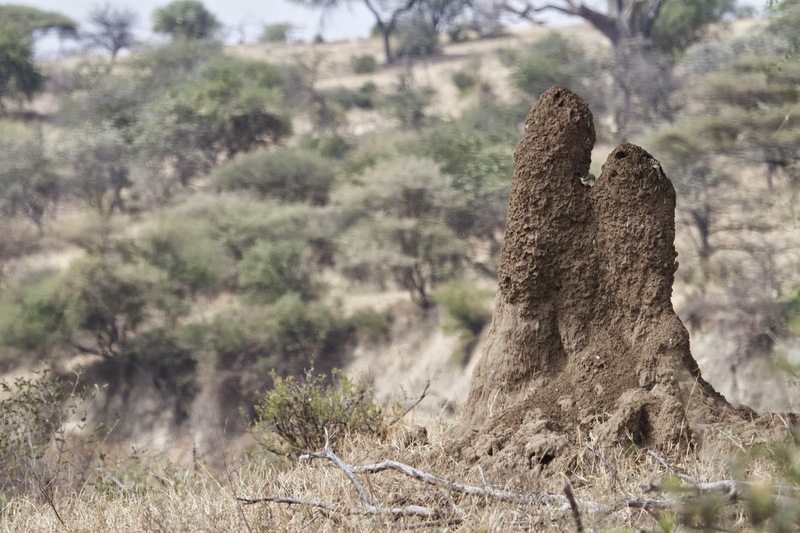 It was also a bit scary in retrospect; what if they were the African honey bees, the famous "killer" ones? Thank goodness they were in a hurry to get wherever they were going. 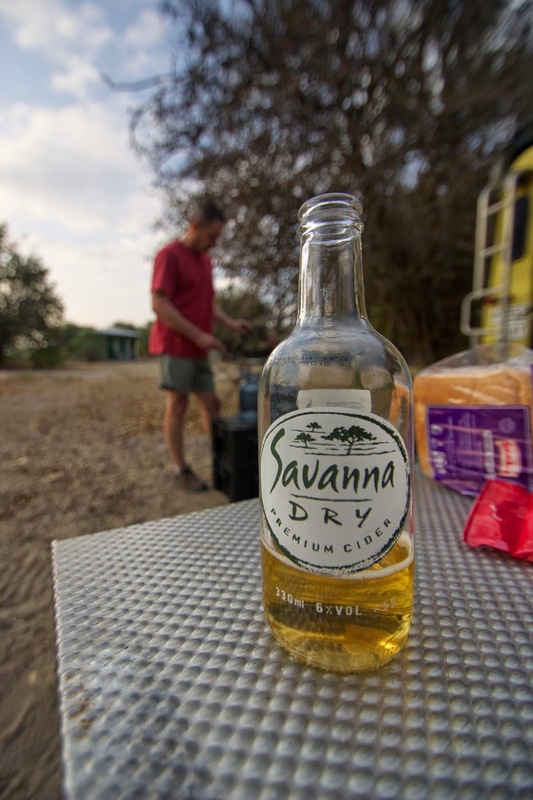 A refreshing cider, Mark in the background cooking up hamburgers for our first real camp meal. Our food box contained a new taste treat: spicy ketchup. 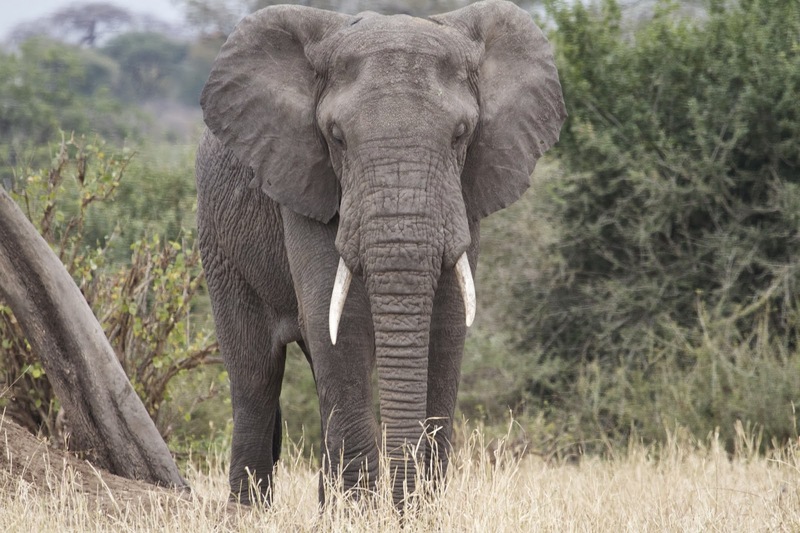 So good we are now looking at specialty stores to see if we can find it here in the U.S.
As we cleaned up our dishes after dinner we looked up to discover a line of elephants walking by camp. 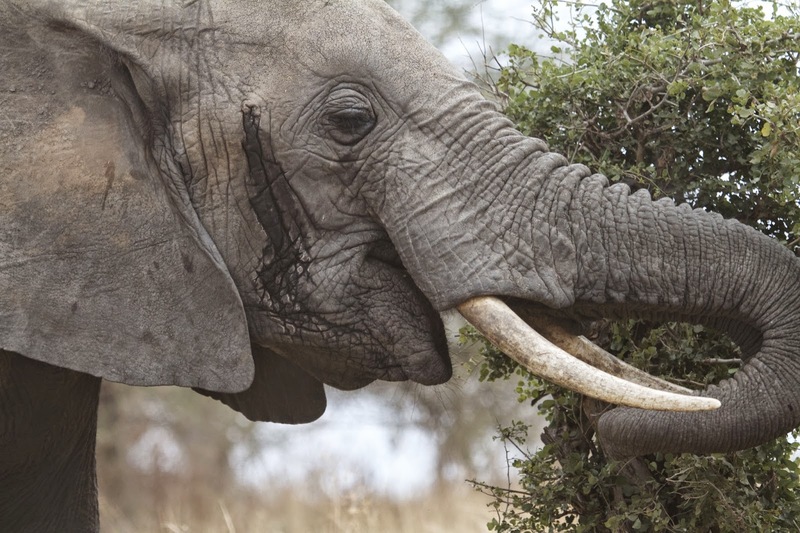 Another surprising thing we learned in Africa: elephants are sneaky. They are so huge you'd think they'd make all sorts of noise, crashing around through the trees and bushes. But they are so quiet it's as if they walk on tiptoe. Their feet are huge and squishy; I think that helps muffle the sound of their footsteps. 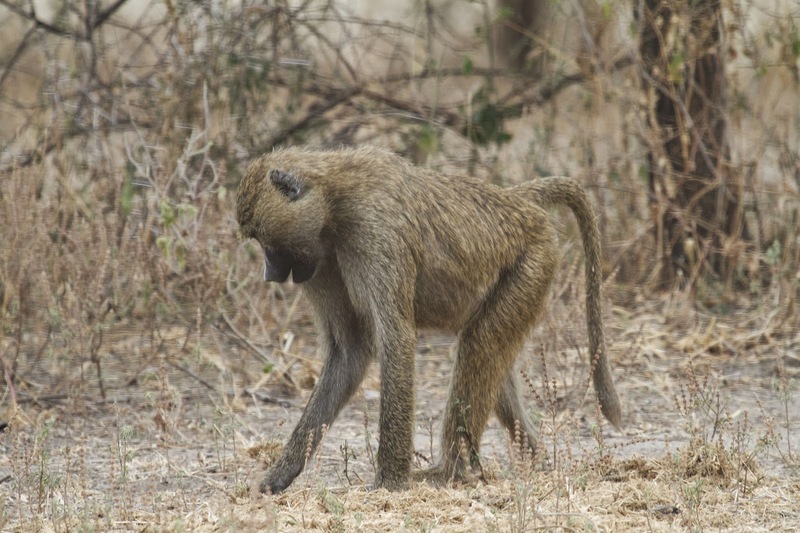 They also walk very deliberately, picking out their next step carefully as they amble along. It's a beautiful sight to see. The campground was located on a slight rise surrounded by a small valley that led to the river. 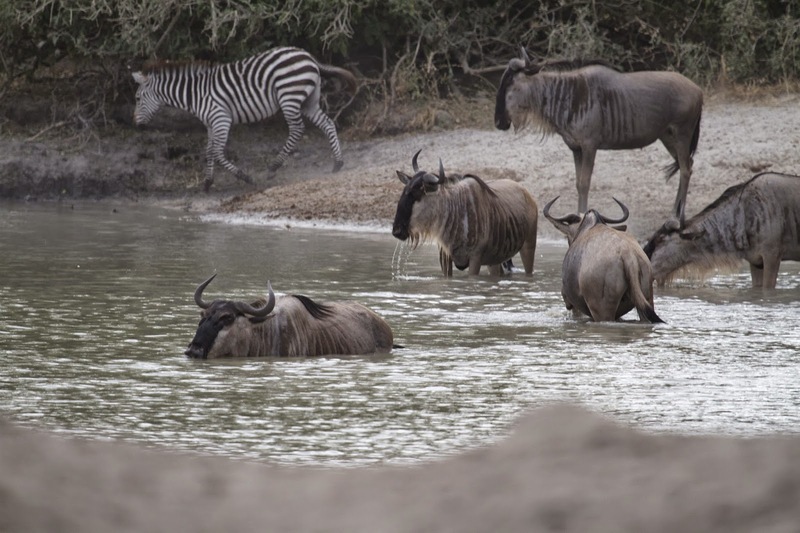 It was a main thoroughfare for the herds of zebra, gnu, gazelle and obviously, elephant. 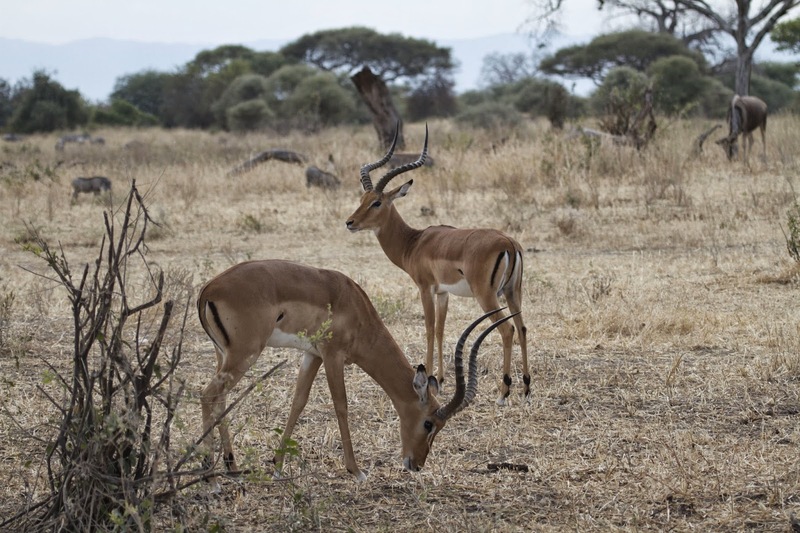 Sitting in camp turned out to be more effective than driving around; the animals came to us. 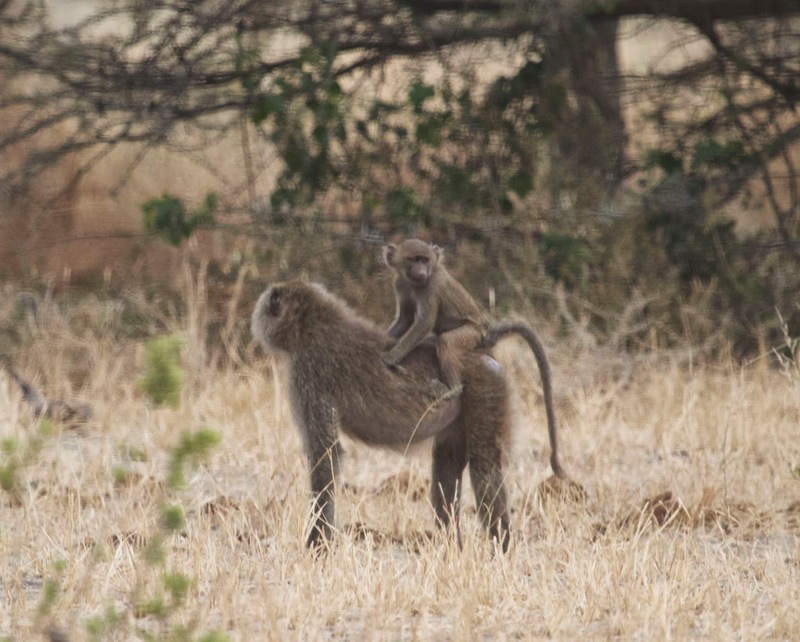 One of my favorite photos from Tarangire: two monkeys groom each other near sunset. We went to bed that night a bit more confident with our abilities and only a little worried about the next day's drive. We made it so far, we reasoned, how bad could it be? Little did we know what was in store for us the next day. 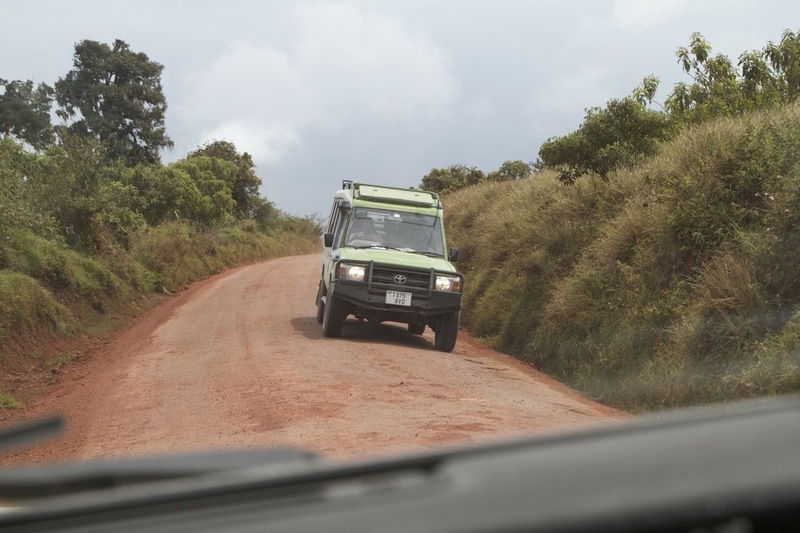 No one, however, warned us about the most terrifying thing that Tanzania threw at us: the roads. This was our view for most of the trip. The corrugation was so bad we had to strap everything down for fear it would vibrate right out (or off) of the car. I will never, ever complain again about the condition of our roads here in the US. Take the worst corrugated gravel road you've ever driven, multiply it by six, throw in random potholes the size of refrigerators, narrow it down to one lane and put two way traffic on it, then heap it up in the middle so the car is at a 25 degree angle when moved to the side. 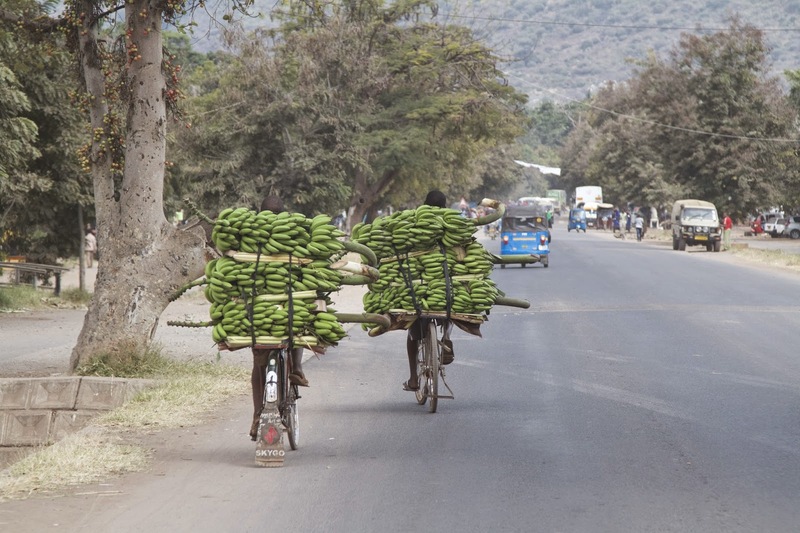 Throw in deep sand, thorny bushes and/or weedy ditches of indeterminate depth on either side and you have a typical Tanzanian road. Oh, and I forgot the random rocky patches peppered with unmarked washed out sections that require delicate four wheel drive maneuvers to cross. 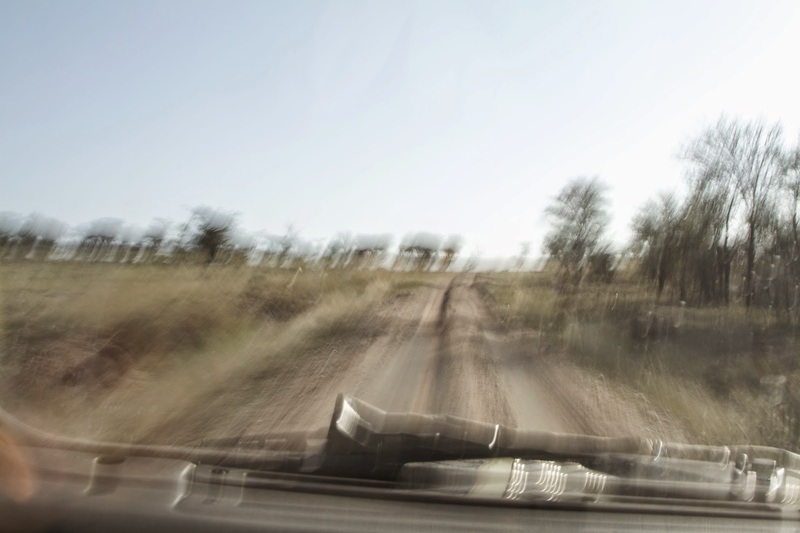 The narrow road around Ngorongoro Crater, with it's high crown, red dust, sandy edges and crazy safari drivers. 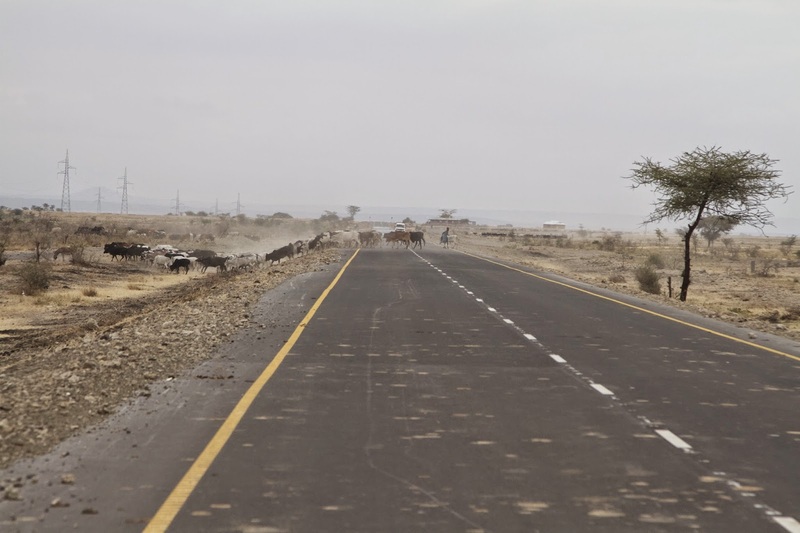 The main road between the Serengeti and Lake Natron. 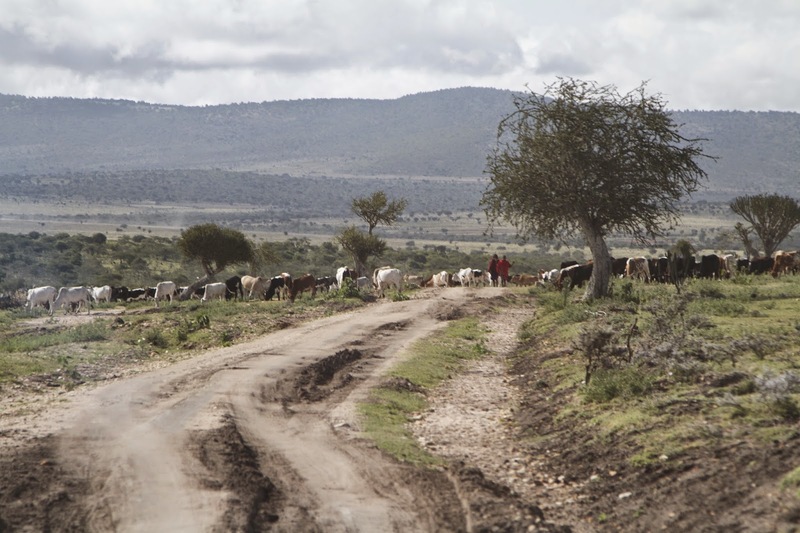 A typical scene on the main highway across northern Tanzania: Maasi driving cattle from one side to the other. City driving was a whole other ball of wax. Take all the motorcycles, hand carts, cattle, trucks and mini-van buses and multiply those by three, then add in hundreds of pedestrians, dogs, larger city buses, those little three wheeled tuk tuks like you see in India, beggars and newspaper salesmen working the lines at the stoplights. This is supposed to be a two lane road. Try telling that to the mini-buses that used the center divider as a passing lane. 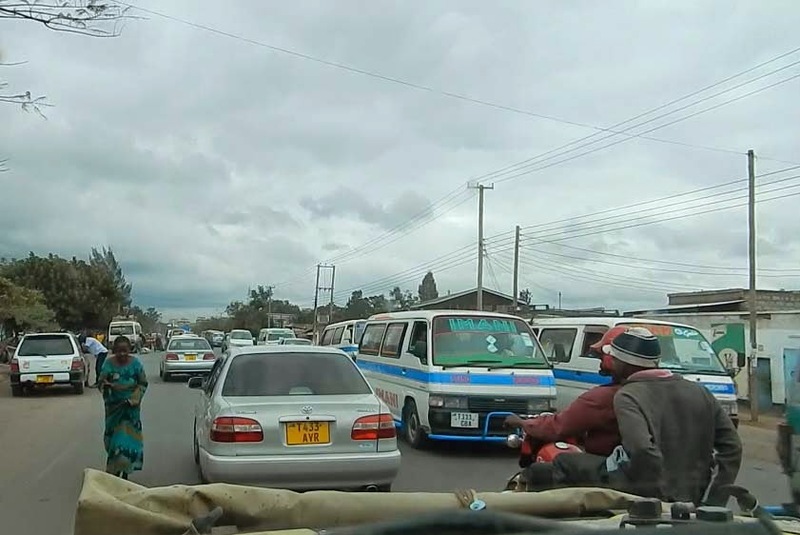 Did I mention Tanzanian's drive on the left side of the road? That was another challenge for us. Poor Mark was thrown into this whirlwind of traffic on the very first day, dealing with a new-to-him vehicle with right hand drive, working the unfamiliar gear shift with his left hand. It would have been nice to have a little practice run, but we had arrived a day late due to an airline cancellation, so we had to hit the ground running if we were to make our first stop by nightfall. After a few harrowing days we finally got used to the roads but it was never a "let's jump in the car and take a drive" kind of place for us (it was more an "I need a drink after that drive" kind of place.) I think you'd have to be there at least a month before becoming really comfortable with the flow of things. We are spoiled here in the US with our paved roads and well marked intersections. We met a guy originally from the UK now living in Tanzania who said you could almost fall asleep driving in the US. He's got a point; maybe it's TOO easy to drive here. Perhaps we need to throw in some wandering livestock and random potholes to keep people from doing the stupid things they do behind the wheel like texting, applying makeup and sipping lattes. I never had the nerve to do any of those things while in the car while we were there and I was the passenger. 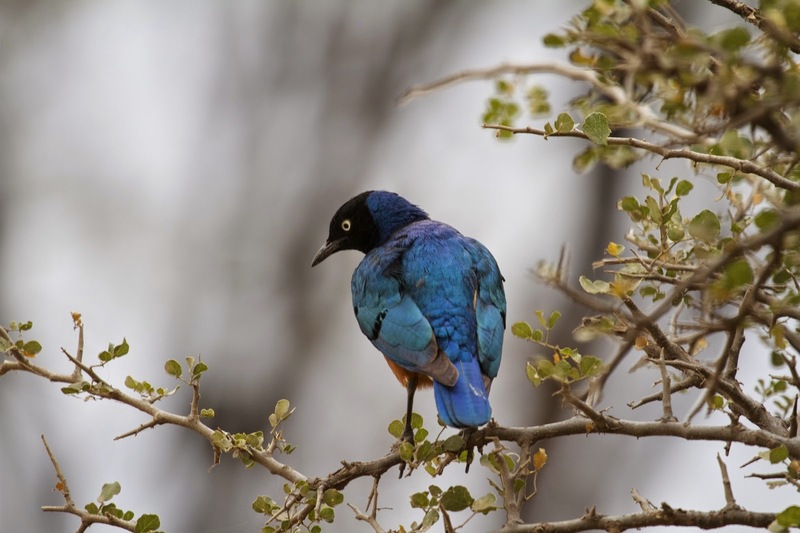 It did get easier as time went on and any discomfort was balanced out by the scenery and wildlife, which ranged from wonderful to breathtaking to stunning throughout our trip. And I'd like to thank Dr. Forni, my dentist, for the excellent work he's done for me over the years; after two weeks of driving in Tanzania I didn't lose one filling. 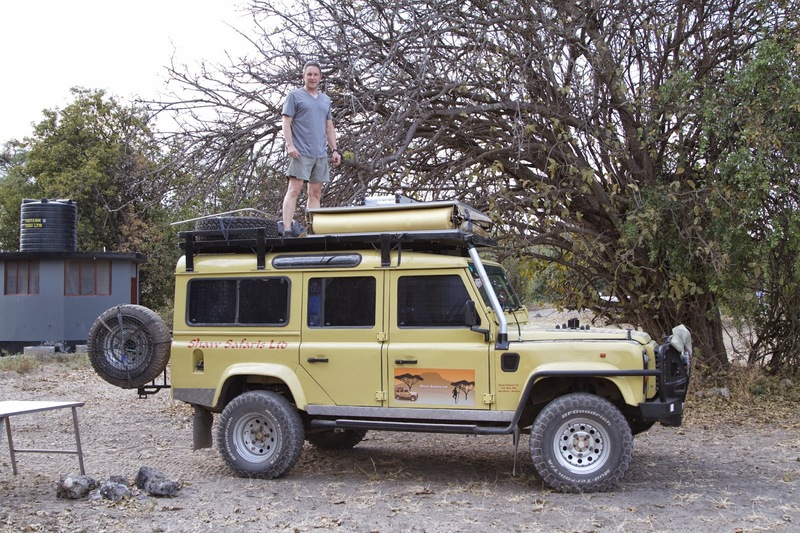 Once we finally arrived in Tanzania, Mark and I were excited to see what the African counterpart of our truck and camper would look like. 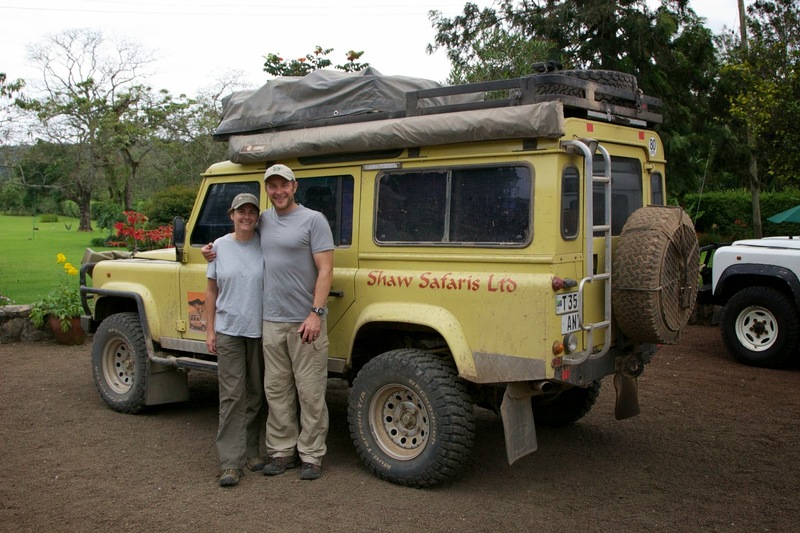 Based just outside of Arusha in northern Tanzania, Paul and Erika Sweet of Shaw Safaris outfit Land Rovers with everything you need to camp and travel through the country. 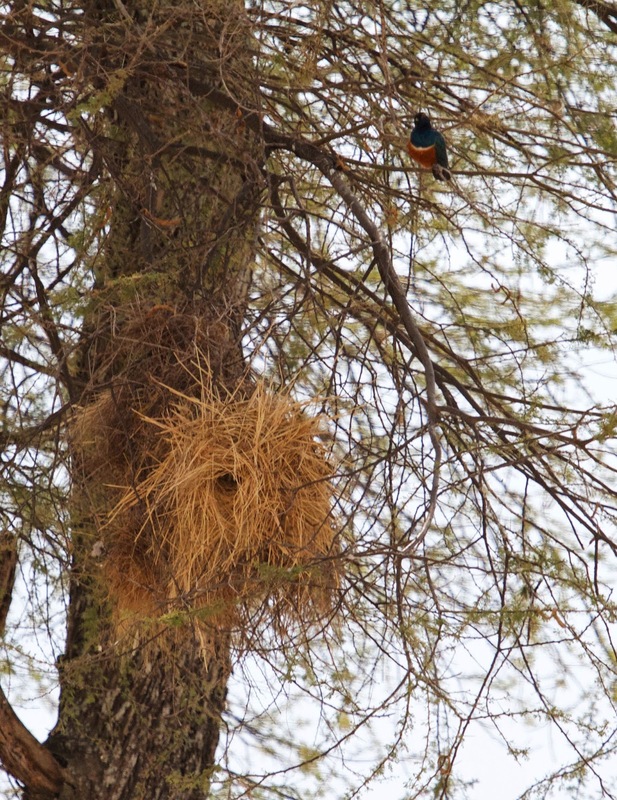 They offered us an itinerary of the multitude of parks there, and even made reservations for us to stay in "special" campsites out in the bush. 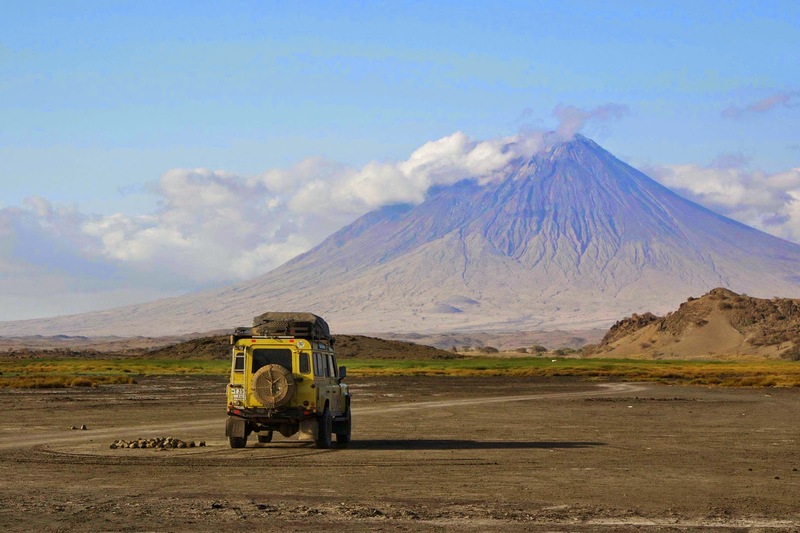 We would still be driving and camping on our own, but we had their guidance to keep us from wandering aimlessly around Tanzania wondering where all the animals were. 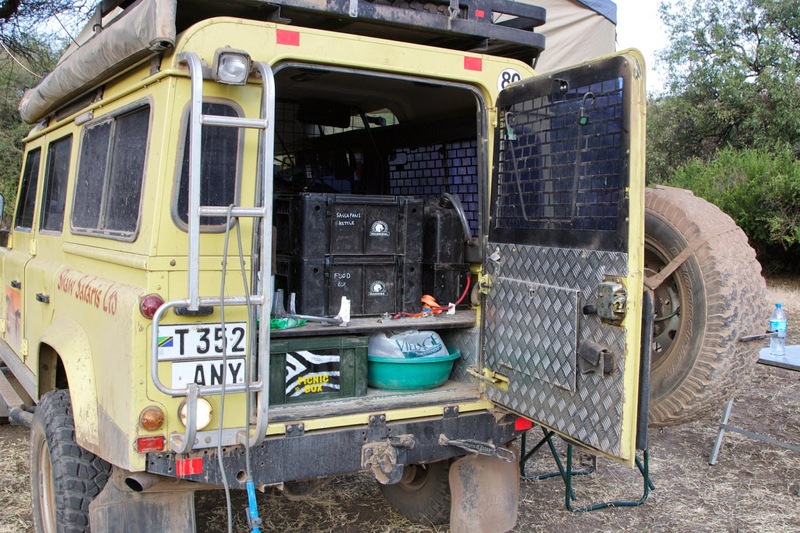 In the back compartment there was a cooler and boxes containing food, pots, pans, plates/cups/bowls/flatware, utensils, cleaning supplies, water for washing, tools for basic road repairs and even a hand pump shower for cleaning up after long dusty days on the road. Here's the rig fully unloaded for dinner. The table tucked up in the rack over the back door between the car and the tent. 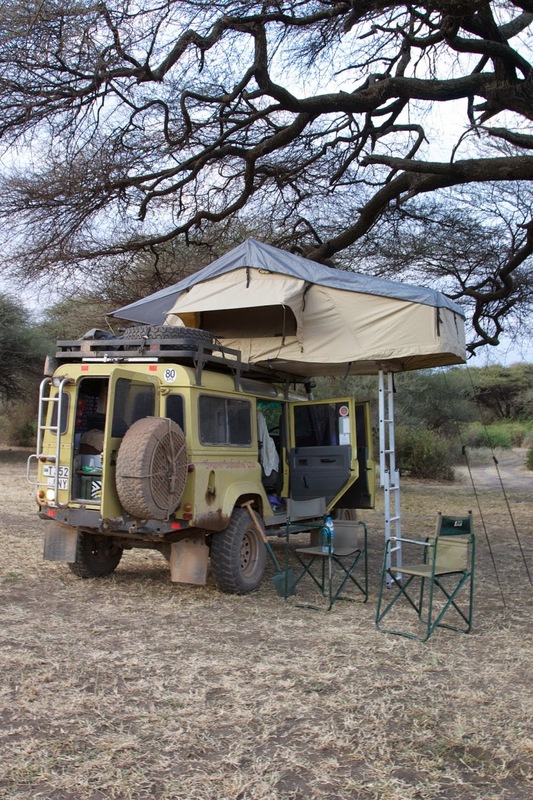 The roof top tent unfolded into a nice penthouse suite. I think Mark liked this job. The tent doubled for shade on the sunny days. 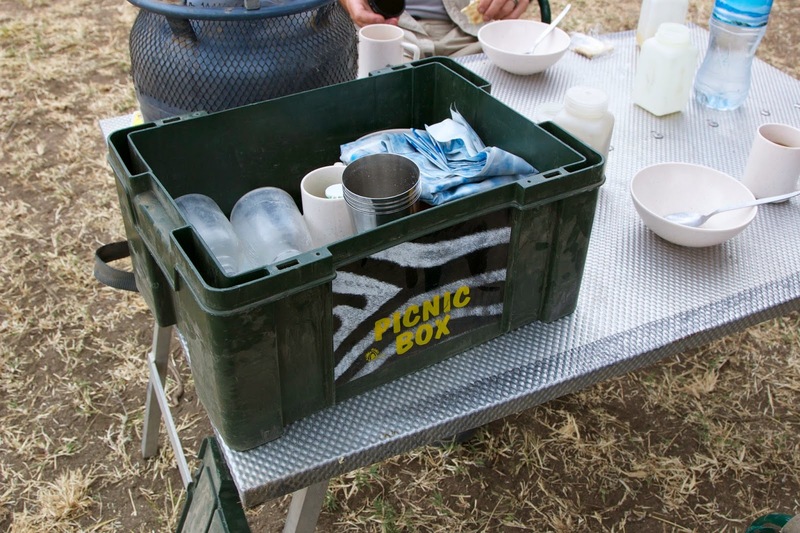 The "picnic box" with all the plates, mugs, cups etc. 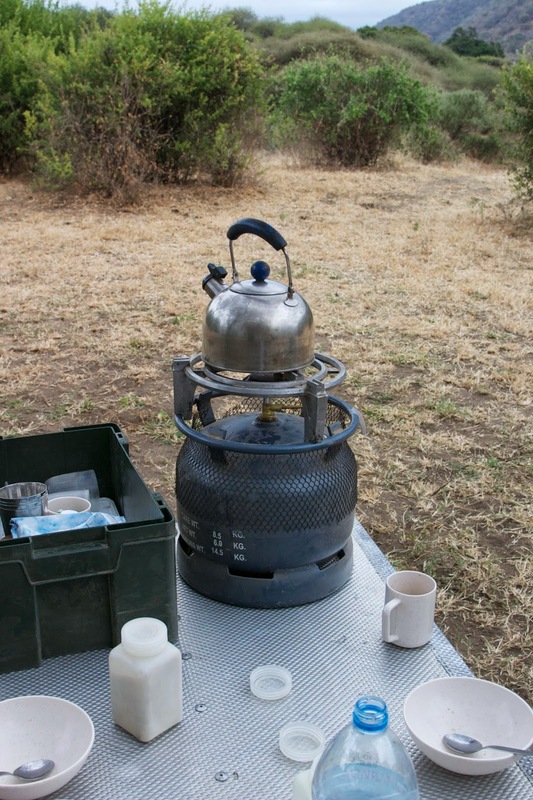 Our one burner stove, complete with tea kettle. Each vehicle is equipped with a cell phone with a dual sim card (to double the chances of having service.) 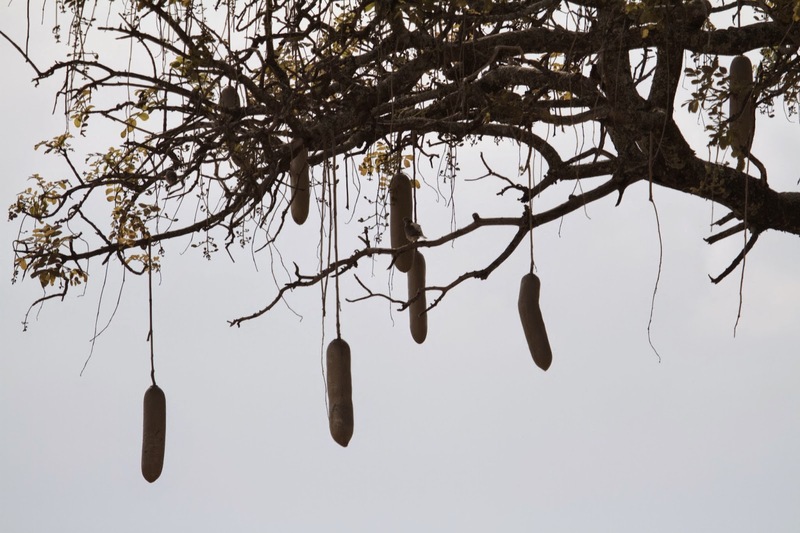 One of the biggest surprises for us was the cell phone coverage in Tanzania; with few exceptions, we had coverage in most of the areas we traveled. If we ran into trouble or had a question, there were pre-programmed numbers loaded into the phone that we could call night or day. There was also a GPS mounted on the dash that helped guide us. This proved to be a saving grace, as the printed maps we had were not always up to date. We found roads there tend to get re-routed, added or sometimes disappear altogether after the rainy season. The roads themselves are sometimes only tracks across the savannah which might be the main route, or they could be a safari driver's off road exploration that peters out to nothing after a few kilometers. It was an education to say the least. 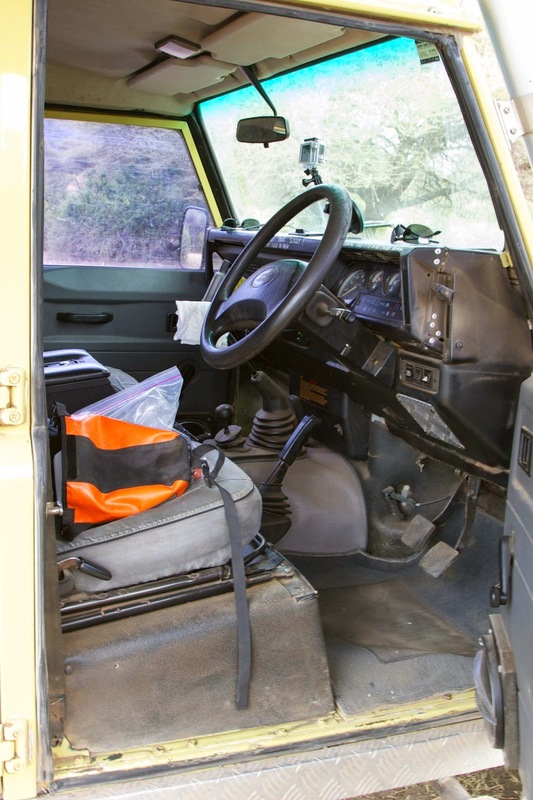 For security, there were two locking compartments hidden in the vehicle. We stored our passports, extra cash and other important papers in these for safe keeping. 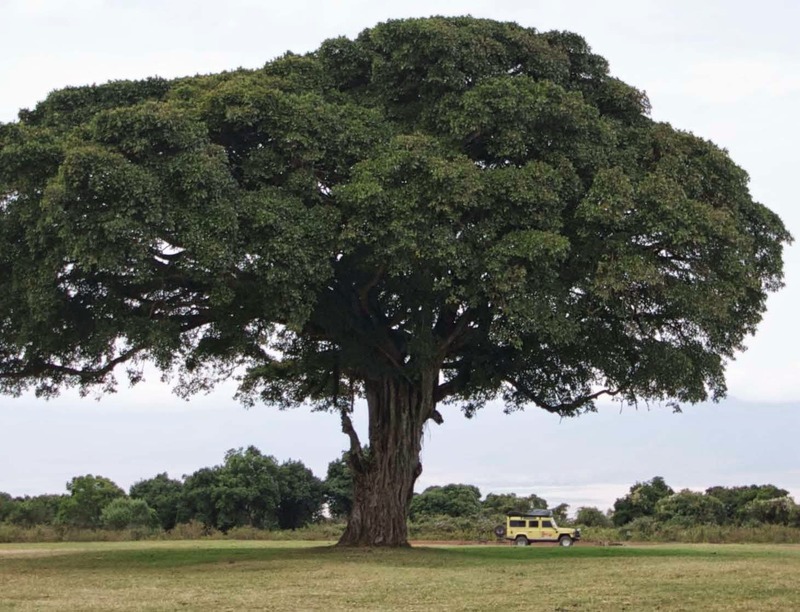 The lone self-drive vehicle in a picnic area parking lot full of tour group vehicles, Tarangire National Park. 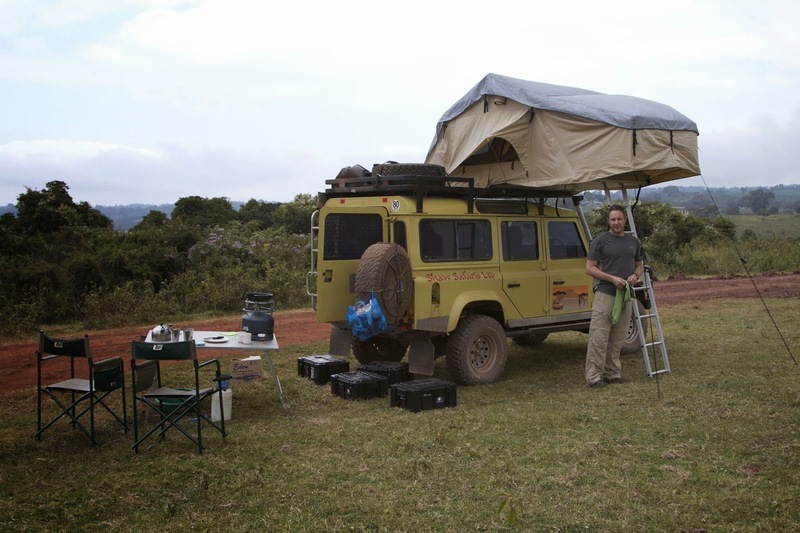 Since we were to be traveling through some remote places, the car was equipped with a high-lift jack, regular jack, tire repair kit and air compressor in case of a flat (or two—it also came with two spare tires.) 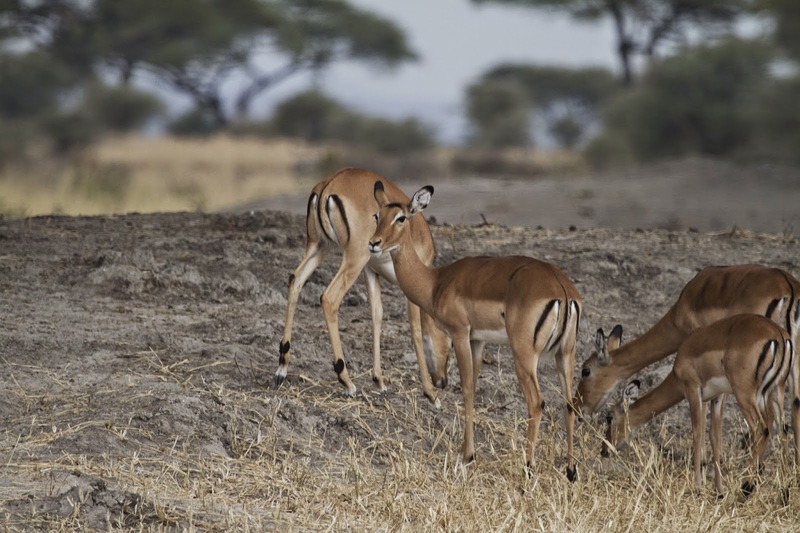 The roads are rough, to say the least, and we saw multiple safari tour vehicles at the side of the road changing flat tires, their clients fanning themselves impatiently inside. We also had an accessory battery that ran the fridge, and served as a backup to the main. We had a box full of extra fluids (brake, steering, oil) and even a spare generator and air filter, along with a very complete set of tools to work on the vehicle. We also had along some recovery items to help pull ourselves out of mud/sand/ditches or anything else we may have gotten ourselves into. All these things were extra insurance in a country where you might be able to make a phone call, but help would be perhaps a day or more away. We were fortunate not to have any major problems thanks to brand new tires and cautious driving. Shaw supplied us with a starter food box, which was really helpful. It contained enough food for a couple days of meals plus basics that we probably would have forgotten to buy: salt, pepper, coffee, tea, milk, sugar, oil and spices. They also supplied a 10L bottle of drinking water to start us off. Drinking water was very important as the local water would have made us sick and, although we were there during the southern hemisphere's winter, it was still pretty warm during the day. There was a 52 liter refrigerator in the back as well, which plugged into the car's electrical. It was nice to have a cold drink at the end of a long day on the dusty road. Back after two weeks, the car (and us) dirtier but no worse for wear. 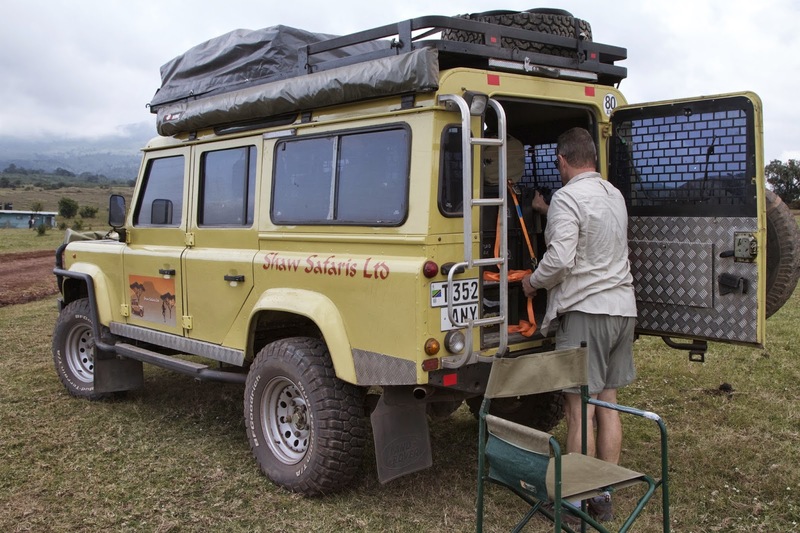 It was the perfect vehicle for Tanzania's rough roads and varied terrain. Although Mark might be in mourning now, it was best to leave Plucky there. 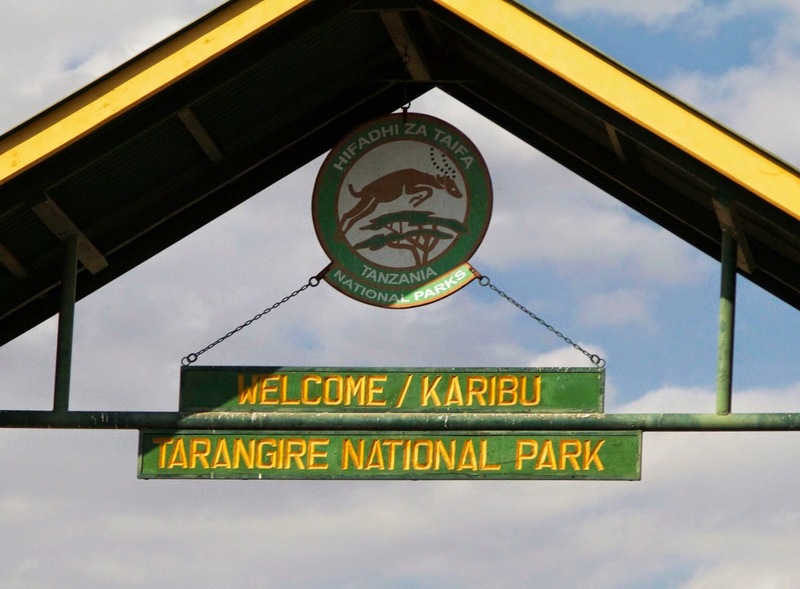 We just might need it again when we go back to explore more of the stunning parks in Tanzania. 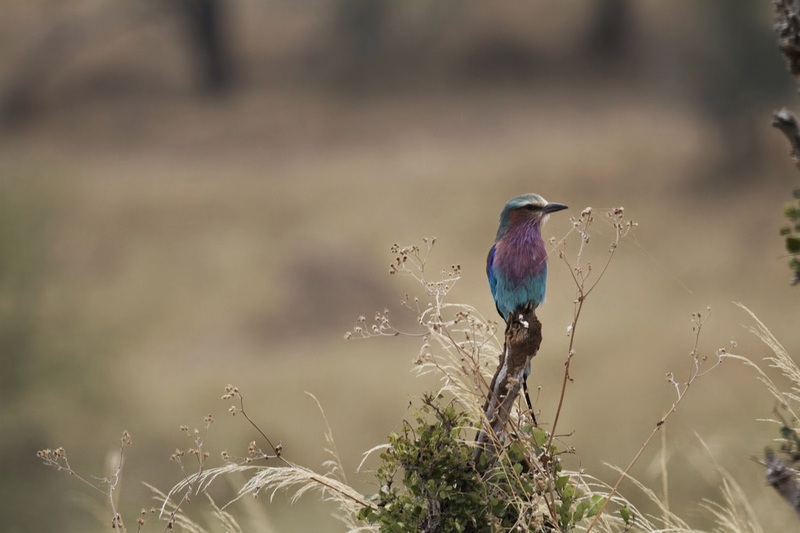 "Plucky" waits for us near Ol Doinyo Lengai, an active volcano near Lake Natron in northern Tanzania.